I took a deep breath as I entered the whelping room. Eight puppy eyes looked up at me, but one drew my attention more than the others. You were the one who was sitting atop the big spare tire that lay in the middle of the whelping box. I watched with interest and amusement as you determinately conquered the huge obstacle. You didn’t give up despite repeatedly sliding off, until you successfully sat on top. Quite impressive for a 5 week old puppy. When I came closer you leapt off the tire, pushing your fuzzy round little body through the pack to reach my outstretched hand. The breeder gave me second pick of the litter. I chose you and another pup on which to temperament test. The results were close. You both displayed confidence, curiosity, attentiveness and a willingness to follow my lead even if it meant having to leave something more interesting. Something clicked however, when I picked you up. Kisses, puppy breath and an unspoken agreement about respect and unconditional love were exchanged at that moment and a bond was formed. Three weeks later, when you were 8 weeks old, I returned to take you home and one of the greatest journeys of my life began. 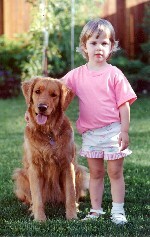 Shana is my first and only Golden and my inveterate companion. Her registered name is Taygold’s Shana Theora, chosen for the Hebrew meaning for “beautiful” (Shana) and the Greek for “watcher” or “companion” (Theora). To this day she has lived up to her name. She has aged well and still possesses a coat shining gold and radiant complimented by a face now white with wisdom. Her eyes still sparkle with excite ment for life and over the years have become the conduit by which we communicate, especially now that her sense of hearing is almost exhausted. These eyes also keep me close. Shana rarely lets me out of her sight and is a master of keen, quiet observation. On the way home from our very first “visit” as a team, my mind returned again and again to the vision of you surrounded by a classroom of grade 2 kids. There you were, smack in the middle of excited adoring active children and you maintained perfect composure and excellent manners. I knew then that you were capable of much more than being my constant companion. My vision fast forwarded to how you would only improve with age. This coupled with my intense interest in animal-assisted therapy ignited a flame that has proven undistinguishable. That was 10 years and thousands of hours ago of therapy work together. I want so much to pay tribute and say thank you to Shana for all she’s given me and other people over the years. My heart is full of her. Just recently, as I faced the dark inevitability of Shana’s passing for a second time, my dear friend Dot Dill reminded me that Shana helped me to discover and expand the human/animal bond. I realize that in some way, each visit that I go on now with my third therapy dog is because of Shana. Nothing I can say or write can adequately express how Shana has affected my heart nor how much I treasure our time together. Now more than ever, as Shana’s journey to Rainbow Bridge comes closer, I find myself reflecting on times past instead of envisioning times to come as I did before. What a grand learning experience this has been and continues to be. Thankfully, memories enable Shana to remain young and vibrant in my mind and part of my tribute is to relive some of the more outstanding ones for this story. Child ren in the classroom, patients in the hospital, elderly residents in the assisted living center, clients in an office, students in a workshop…..Shana was faithful in providing unconditional acceptance and intuitive attention to them all regardless of age, malady, their ability to interact with her or their level of interest in her. I can’t possibly single out which experiences to write about on the basis of being special, because every visit was in its own way special. What I’ve chosen to do is identify three of Shana’s most outstanding therapy dog qualities and relate three experiences in which they were most vividly displayed. Shana’s outstanding qualities include intuitiveness, tolerance and joy in her work. Intuitiveness. The waiting area at the CSU Veterinary Teaching Hospital in Ft. Collins was fairly full one particular morning. Shana and I were no strangers to this place, having come here many times after she was diagnosed and treated for cancer. We were there on this morning because I was dropping Shana off for another surgery to remove a broken molar. As I looked around the room there were a number of dogs, mostly Goldens and Greyhounds, waiting with their persons. Some were anxiously whining, some were just lying there too weak or broken spirited to expend any energy. Some smaller dogs were being held so closely and tightly they appeared uncomfortable. I wondered how many people in the room were going through the same agonizing experience that I did of being faced with the probability of cancer taking away their beloved companion. Regardless of what they were there for, not one person’s demeanor reflected joy. Portraits of apprehension, deep concern and heartfelt sorrow abounded. Shana, despite being in a place that always seemed to be a source of pain and discomfort for her, treated this visit as she did every other – it was a new and exciting adventure. She was the most perky dog in the waiting area, something I was almost embarrassed by considering the sorry state of the other dogs. She seemed very eager to “do” something and since we were in a waiting area that was not all that different than a waiting area in a hospital, she was in “therapy dog” mode and I sensed she felt a need to spread some cheer amongst the gloom. Needing some cheering up myself, as I was concerne d about Shana’s impending surgery at her advanced age of 11, I relented and, pretending to get up and look for a magazine to read, I allowed Shana to “work the room”. 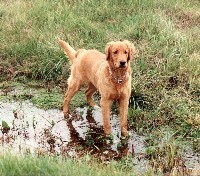 Eager hands reached out and frowns melted into smiles and, for a moment people forgot about their cares and were amused by this friendly, carefree Golden trotting past them with her tail held high and wagging. Interestingly enough, Shana chose not to stop at any one person for any length of time. Instead, she mostly sniffed and some people were given a quick lick. But then everything changed. Shana approached one woman, and stopped and sat by her side. 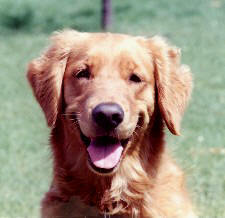 Only when the woman reached out to her did Shana respond with a paw on her knee and a loving Golden smile. As I often did when we were visiting in the hospital, I let the moment unfold in silence without attempting to alter it with needless chatter. Shana stayed by her side as the woman stroked her over and over again. This was clearly one of those moments when time seemed to stand still and no one else existed except the woman, Shana, and me. At this point, Shana was called. It was time for her to go to be prepared for surgery. Before we left the woman however, I was compelled to ask, “Are you okay?”. She looked up and the tears welled in her eyes as she told me, “My dog just died.” As I was telling her how sorry I was to hear that, the vet tech was taking Shana from me. I gave my old girl a quick kiss and left her with instructions to be sure to return. I held her soft Golden head in both my hands and whispered into her ear, “You did a good thing for that lady.” I watched as the tech walked my old partner down the hall to the double doors of the clinic. She trotted along compliantly, tail held high and wagging even on the way to the operating room. She sneaked a look back at me. How she knew in that waiting room full of people which person needed her the most, I’ll never be able to explain. What I do know is that Shana has astounded me many times with her marvelous intuition. Tolerance. As I entered the Day Room of the Psychiatric Unit, escorted by the Lead Therapist, I became keenly aware that I had entered into an AAT situation that was complex and highly unpredictable. I needed to pay extra attention to everything going on around me, including the reactions of Shana, to ensure a safe and effective visit. Pre-screened patients were seated in a circle around the room. Shana and I went from chair to chair, interacting with each patient under the guidance of the therapist, who carefully observed and documented the impact of my therapy dog. It was a demanding environment for both me and Shana. Each patient presented with different symptoms as a result of a variety of disorders, some patients having multiple disorders. This required that we adapt differently to each person, working very hard to look beyond their disorder and reach the person within. One of the patients was enjoying a rather lengthy petting session with Shana. I watched both Shana and the patient very closely for any sudden change in behavior. Suddenly, the patient grabbed Shana’s vest, manipulating it roughly, and held her tightly to him. As patient and tolerant as Shana is, I knew that I would need to manage the situation so that the patient’s aggressiveness would not escalate and that Shana would not be hurt or traumatized. She began to pant as her stress level increased but she maintained focus on the task at hand and did not attempt to leave the situation. Instead, she looked at me and as she so often did, communicated very clearly with her eyes. She placed complete trust in me to get her out of harm’s way. Respecting the therapist’s responsibility to diffuse the situation, I told her that if this patient did not let go within a few seconds, Shana could be in danger of being harmed. Her attempt at verbally and then physically trying to break the patient’s hold on Shana was ineffective – the patient only became more agitated and increased his grip on the vest. My sole focus and concern then became that of my partner. Within seconds, I was able to release Shana by undoing the quick release tabs on her vest and pulling her toward me. 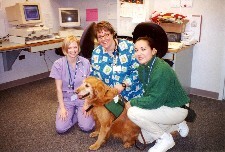 The patient continued to hold the vest but Shana was safe in my arms. In that situation, she could have chosen to react differently in order to get away. Instead, she chose to trust me and exercised amazing tolerance in what could have been a very dangerous situation for her. |Joy. 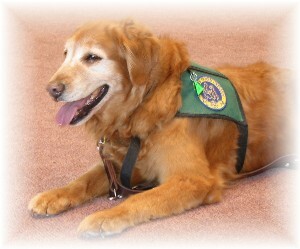 One particular attribute that exemplifies a stellar therapy dog is that they actively seek interaction. Not only does Shana actively seek interaction, she does so with great joy. Her Delta Society therapy dog vest hangs on a hook by the front door. To this day, if I take her vest off the hook she springs into action and stands ready to have it slipped on so she can go to work. I’m very careful not to put on my current therapy dog’s vest (my black Lab, Rigo), until I’m out of the house and away from Shana’s watchful eye. Even though I strategically phased Shana out of therapy work and into retirement, she still takes great joy in visiting and can become depressed if she sees me leaving the house to go to work with one of the other dogs. She dons her vest every once in awhile to visit a friend’s house or even one of the family when they’re sick, just to remain somewhat active as a therapy dog. Joy is an attribute that permeates Shana’s being. True to Golden form, she takes great joy in eating and is likely frustrated by the fact that I have her on a carefully controlled diet fed twice a day at specific times only. To see her smiling face, even at the age of 14, when we go for a walk together, just her and me, is an expression of sheer joy. To observe her reactions to being groomed (bathed and brushed), is clearly joy as evidenced by closed eyes and a “died and gone to heaven” smile. 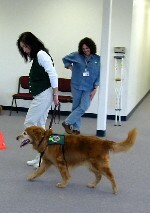 Shana’s greatest joy however, is definitely expressed when she’s working as a therapy dog. She never walked, rather she ran to have her vest put on, such was her eagerness and joy to go to work. If a dog can be said to work with a passion, Shana thrives on visiting. I think she figured out a long time ago that the more affection one gives out, even more is returned. Shana grew up to be all I hoped for and more. I remember carrying her up the stairs when she was a pup. Now, as she has grown old, I help her up the stairs again. Looking back on my journeys with her as a therapy partner, I have some wonderful thoughts of times shared with patients and school children and events made especially important because my life was touched in a deep and unforgettable way. Memories are a wonderful gift. Through them we can keep important parts of life close to our hearts. There is one memory that will last forever, the one that not only touched my heart but changed it forever. This is a moment that I experience with each one of my dogs. The moment that I realized that Shana trusted me will always stay with me. With her, this moment occurred when I first helped her chubby little legs up the stairs when she was learning how to conquer them. Trust has proven time and time again to be the foundation for our amazing partnership over so many years. I have experienced Shana’s trust in me many times over as we visited countless new and strange environments and, most recently, as I helped her arthritic legs up the stairs this morning. This ability to resist her own independence and allow room for vulnerability to follow my will is something that I have never abused. 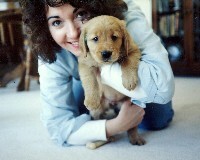 It nearly broke my heart to retire Shana as my therapy partner. When she was 12, I began to notice less tolerance for visiting with children, especially those who wanted to crawl all over her. She began to tire after visiting for only 1 hour whereas, in her prime, she still had energy left over after 2 ½ hours of visiting. Visits to hospital rooms became shorter and shorter as Shana would decide it was time to leave by facing the exit after only a few minutes with a patient. I distinctly remember being in the stairwell with Shana at Swedish Medical Center, where we visited weekly, and she had difficulty doing the stairs that she not so long before had sailed up with ease. I tearfully decided then, that that day would be her last at Swedish as my heart accepted what my head had known for awhile – it was time to retire my partner . Knowing Shana, she probably stoically climbed those stairs with me longer than she wanted to but she tolerated it for me. 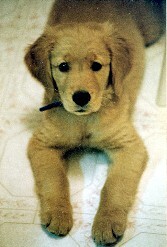 In September of 2003, Shana retired at the ripe age of 12. In the year following retirement, Shana unfairly suffered ill health after giving of herself so unconditionally for so many years. 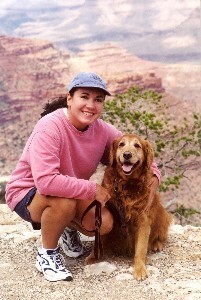 She survived a serious bout of Lyme’s Disease which nearly left her vision impaired and lame. She suffered a stroke which has left her with permanent balance issues. She dodged the cancer bullet for a second time just this past fall when, with grave concern over tumorous lesions in her mouth, which the biopsy this time confirmed, as thankfully, benign. Today, at the age of 14, her hearing is almost gone but her vision is great as is her desire to enjoy life to the fullest. Therapy did away with the lameness from Lyme’s and despite weakening arthritic back legs, we still enjoy our daily walk together, albeit the distance is shorter than in previous years. What has remained unchanged is Shana’s heart of gold which is full of unconditional acceptance, unwavering loyalty, and complete devotion. Shana, I can’t bring myself to imagine a day without you in it - when I won’t see your joyful smile, hear your happy bark, feel your soft fur, or sense the weight of your head on my lap. What an unforgettable, awesome journey this has been. I’ll never forget all of our amazing adventures. My love for you will never change. Happy Birthday Sweet Girl! (Shana was 14 years old on January 28, 2005). "All that we’ve shared is woven in our hearts, each thread is a memory from which we will never part." Shana taught us many things…..she lived in the present moment and, to her final breath, she offered herself to it fully without reserve. She communicated volumes without saying a word, teaching a capacity for openness that is perceptive and life-giving. In giving of herself so unselfishly, she exemplified what it means to be truly authentic. I didn’t realize until she was gone the immense role that Shana played in what I’ve become. Her ever-affirming presence is now a gaping hole. I was fortunate to be able to include Shana in my work and this had a tremendous impact on the depth of our relationship. With each day, the familiarity and ease that developed between us evolved into an unspoken harmony. Donations in Shana's honor can be made to the Morris Animal Foundation, a non-profit foundation that funds humane animal health studies to advance veterinary medicine. 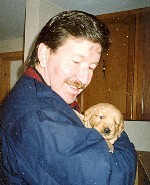 To donate, please go to this page and select the option "I would like to memorialize a pet" and complete the form. Thank you!